Connecting a balance to a laboratory network allows workers to efficiently gather measurement data. Technology advances in balance-to-network connectivity have paved the way for Adam Equipment to offer new solutions for data collection, such as Adam DU. DU quickly collects information from up to eight Adam balances simultaneously, using RS-232 or USB connections. 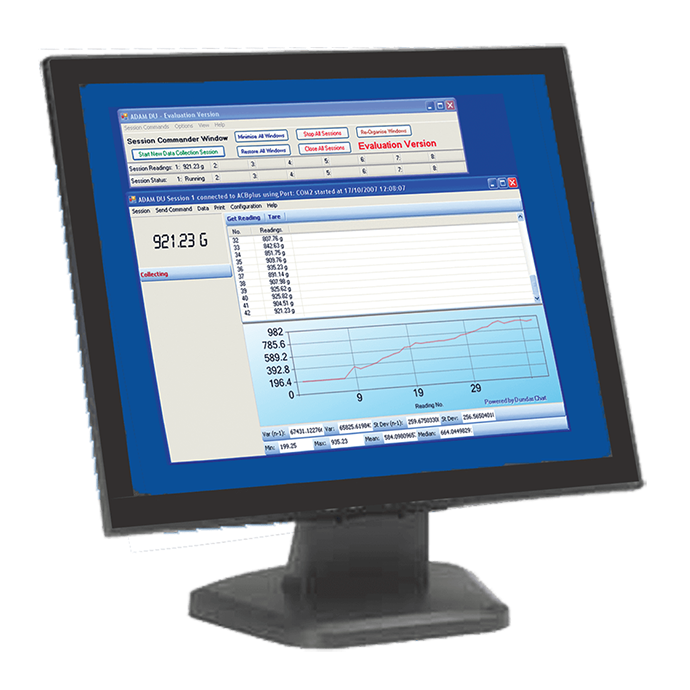 The software features an easy-to-use interface with a main command window to view and manage data capture sessions. Real-time graph readings provide visual assessments of progress, while users can collect date, time and balance identification information on raw data or graphed readings. Adam DU facilitates the export of captured readings to other file formats, including text, csv, html and xml. A search function helps locate specific information, such as maximum or minimum readings. Adam DU provides basic remote control of the balance, in addition to graphing data and exporting the readings to other applications, including Microsoft Excel, Microsoft Word and Windows Clipboard. Laboratory users can perform statistical analysis on readings and capture custom data, since Adam DU supports up to six additional user-defined data fields. Adam DU also logs and stores calibration reports, allowing complete tracking of calibration records. When used in tandem with an appropriate balance and density determination kit, users can easily collect density readings. Retail and counting scales can provide a compilation of details about unit weights, piece counts, unit prices and total prices. On production lines, DU captures tare weight, net weight and total/gross weight from any scale in the network.